In 1907, a 14-year-old boy named Cromwell Dixon took to the sky in a flying bicycle that he designed and built with the help of his mother. Despite disappointment (an early prototype caught fire) and mistakes (a too-heavy vehicle), the teen persevered. He eventually made a glorious showing in his flying bicycle, soaring above the highest buildings in his hometown of Columbus, OH. 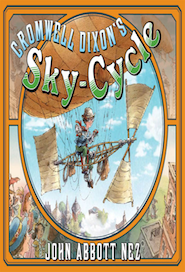 Later that year, Dixon entered his Sky-Cycle in the St. Louis Airship Carnival, taking home a prize.